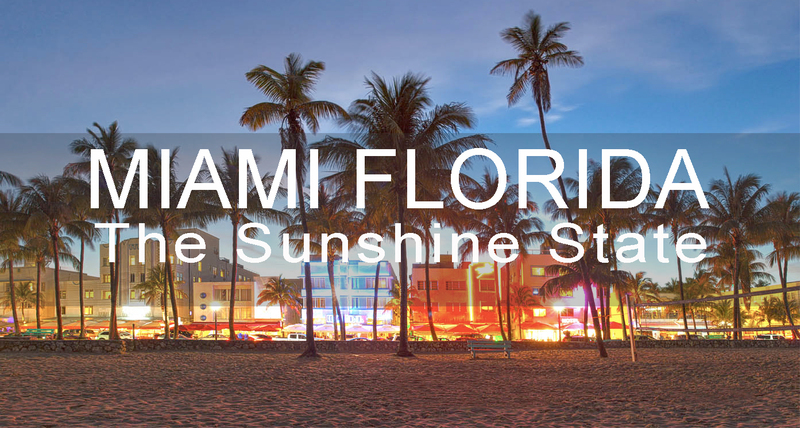 Miami Beach, Florida – It is America’s Riviera; a cosmopolitan city whose residents are as diverse as its visitors. The first South Floridians were the Tequesta Indians, who discovered the area more than 10,000 years ago and had it all to themselves until the Spanish claimed it in the 16th Century. In 1821, the Spanish flag was lowered and the Stars and Stripes raised over Florida. Enterprising wreckers from the Bahamas came to South Florida and the Keys in the early 19th Century, to hunt for the remains of an international array of ill-fated ships that crashed onto the treacherous Great Florida reef. At about the same time, the Seminoles arrived, along with a group of runaway slaves. They fought to stay in Florida, and the area became a war zone from 1836 until 1857, with most non-Indian residents being soldiers stationed at Fort Dallas on the Miami River. Some of these soldiers and a few other adventurous frontier settlers gave Miami yet another new, foreign-born population. At war’s end, many of the Indians remained in the Everglades. The Bahamians who stayed became Miami’s first permanent residents and helped found South Florida’s first real community, Coconut Grove. The area’s greatest change came thanks to a visionary Cleveland widow named Julia Tuttle, who purchased 640 acres on the north bank of the Miami River in 1891, moving her family into the abandoned Fort Dallas buildings. Within four years, Tuttle — the “mother of Miami” — convinced Standard Oil co-founder Henry Flagler to extend his railroad to Miami, build a luxury hotel, and lay out a new town. The railroad arrived in 1896. The City of Miami was incorporated on July 28 that same year. All kinds of people flocked to the new city, which was never an ordinary Southern town. Miami’s first mayor was an Irish Catholic. Most of the early merchants were Jewish. African Americans and Black Bahamians made up one-third of the city’s incorporators. Greater Miami never lacked for forward thinkers, including John Collins (a New Jersey Quaker) and Prest-O-Lite king Carl Fisher, who together in 1913 embarked on an agriculture venture on a spit of oceanfront beach and started a bridge across the bay. Miami Beach was born. During the Depression, Pan American Airways launched the era of modern aviation with “Flying Clippers” from Miami’s Dinner Key. Even then, Pan Am advertised Miami as the “Gateway to the Americas.” Today, Greater Miami has overtaken New York’s JFK as the nation’s leading gateway for international arrivals with 5.1 million international travelers arriving in the U.S. through Miami in 1994. Also during the Depression, another new group, predominantly Jewish, came to Miami Beach and built a large number of small hotels with stark moderne lines along lower Collins Avenue and Ocean Drive. This building boom helped bring the area out of the Depression and forty years later would become the world-famous Art Deco District, which includes the internationally renowned South Beach area. World War II brought another 100,000 people to Greater Miami and the Beaches when the Army Air Corps and the navy established major training centers. Many of these servicemen made the area their permanent home after the war. By the end of the 1950s, South Florida had doubled its pre-war population. When Fidel Castro took over Cuba in 1959, no one dreamed that the revolution would change Miami as much as Cuba. The Cuban exiles who were just beginning to pour into the area were bringing the next Miami with them. The ’60s and ’80s brought mind-boggling change as more than half-a-million Cuban exiles fled to Miami to start a new life. These enterprising refugees launched the area into its future as what many call the “Capital of the Americas. The 1980s and early ’90s brought a multi-billion dollar infusion of investment capital that produced a beautiful new Miami downtown skyline, a reborn Miami Beach, a modernized transportation infrastructure and a new way of life that features the arts, culture, sports and entertainment, all with an international accent. Although it has changed almost beyond recognition (again), Miami Beach has thrived amidst change and overcome many difficulties. 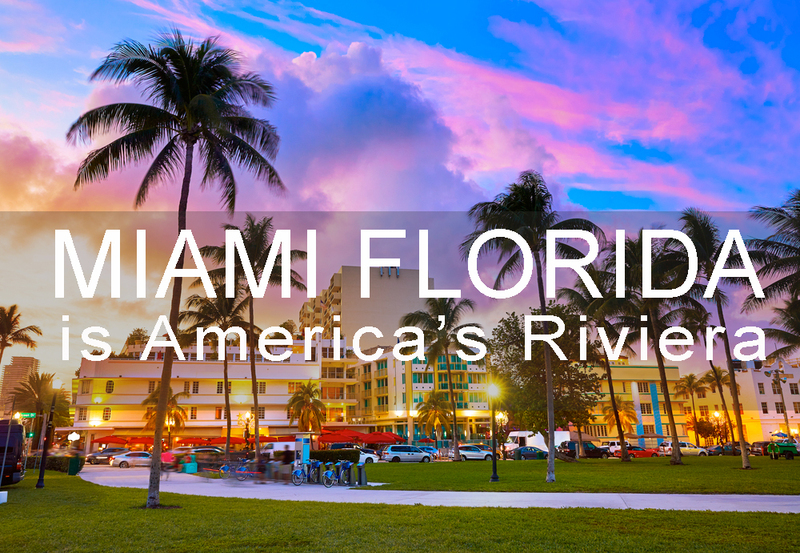 Greater Miami and the City of Miami Beach continue to be an international mecca for travel, business and to establish a home. Miami’s climate is sub tropical. The only other place in the United State with this type of weather is Hawaii. The combination of heat and humidity can be uncomfortable May through September, although cooling ocean breezes help moderate the temperature. Miami actually has fewer sweltering hot days each summer than many areas in the northern part of the state. In winter, it’s one of the warmest places in the United States mainland. Rain can occur anytime of the year, although most falls in summer in the form of brief, heavy thunderstorms. Hurricane season generally runs June through November, with most of the storms, on average, occurring in August and September. Plenty of advance warning is given for these types of storms. Beaches, shopping, restaurants and night clubs. . . Miami has it all! Check out the links below for more information.